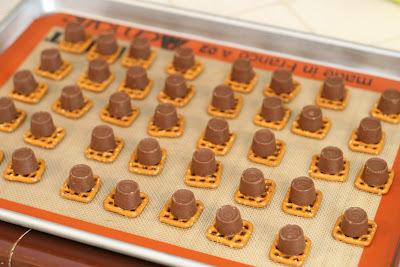 Rolo Pretzel Bites. A "Frighteningly" Good Sweet & Salty Treat! I have a SERIOUS weakness for sweet and salty combos! So when I saw this delicious little morsel I think my heart skipped a beat! ;-) I guess they’ve “been around” for a long time….but unfortunately (or fortunately!) I had never heard of them! Until now! Spotted these little bite-sized pieces of heaven over at GloriousTreats.blogspot.com. It basically involves putting pretzels on a baking sheet, putting one Rolo (unwrapped of course) on top of each pretzel, “baking” in the oven at 250 degrees (or as low as your oven goes) for no more than 5 mins, then taking them out and pressing a pecan half on top! Voila! If you’re impatient like me….throw them in the freezer for a few minutes and they will be ready to devour! If you have a little self-control (unlike me), just let them cool on the counter then put in a container for munching on later. These would be a great treat to take to church or school parties…or for your own Halloween bash! SWEET AND SALTY……..a match made in food heaven! I make these but I use the round pretzels. I put the pretzels on wax paper in a jelly roll pan, place rolo on pretzel and put in oven for 3-5 minutes. Then I bang the pan on the counter, so the candy falls down. Place nut on top and let cool. Walmart carries a store brand carmel candy like Rolo that only has little cupcake paper on them. Works great, and easy! You can also make these with HERSHEYS KISSES–the unwrapping is the “hardest” part! LOL!!!! We found that placing the pretzels in the oven for a minute or two before we put the chocs on helped them “stick” and not fall off when putting on the oven rack–then top with another pretzel or? One of our kids teachers liked this soooo much she ate the entire batch on her lunch—so we went home and made another double batch for her to TAKE HOME to her family! How is it that these stick thin women can EAT like this!!!!!! LOL!!!! I actually found these on a different website and just had to try them. They are SUPER easy to make and most of them disappeared before even making it to the frig. I prefer them at room temperature. There is just something about cold, hard caramel that doesn’t appeal to me. Great Recipe! !